If it’s possible a terrorist could could enter your premises, commit an attack, and leave afterwards without detection, then it might be time to look into upgrading the security in and around your property. In August 2017 the Prime Minister’s office put out a media release announcing the Australian government’s ‘Strategy for Protecting Crowded Places from Terrorism’. The strategy is described as a ‘how to guide’, designed to provide owners and operators of ‘crowded places’ with guidance on security practices. According to ASIO, the terrorism threat in Australia is ‘probable’ – which basically means it’s likely to happen. Terrorism is defined as a tactic involving the use of violence and/or intimidation to achieve a specific aim, usually a political one. Terrorists mostly target civilians, committing their acts of terror in places where large crowds gather. Crowded places that have poor or inadequate security are often particularly attractive to potential terrorists, as they can be seen to be easy targets. 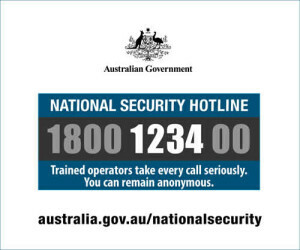 Various organisations and authorities have a responsibility for tackling the terror threat in Australia. These include local and state/territory governments, ANZCTC (Australia and New Zealand Counter-Terrorism Committee), the federal government, ASIO, the police, and private security firms. Community members can also play a part, by being aware of their surroundings and reporting anything suspicious to authorities. Owners and operators of crowded places – including churches and faith centres – also have a responsibility to take steps to protect their premises from terrorist threats as much as possible. This is not a one-size-fits-all exercise. It’s up to each individual organisation to evaluate their risk level and tailor their risk management strategies accordingly. Deter – property fencing, external lighting, warning signs, security patrols. Detect – CCTV, detection systems, screening devices for people and vehicles. Delay – building security layers, the presence of trained staff, outside vegetation and bodies of water. Respond – emergency response plan, and steps for recovery and rehabilitation. It’s important to note that security is not something you ‘do’, but rather needs to be a permanent feature of the organisation. It needs to start with understanding the risks of an attack. Naturally this includes the risk of physical harm, but there are also commercial and legal risks and the possibility of damage to reputation. It’s also important to recognise that you cannot protect the organisation from every possible event but instead need to prioritise actions according to the highest risk. Running a full security risk audit of your premises (see links at end). Designating someone in charge of security in your organisation. Developing a documented security policy. Risk management for individual events. Designating an assembly area for emergencies (as distinct from that of your fire plan). Regular reviews of security procedures and updating them where needed. Keeping up with security information and advice. Updating policies and procedures in line with new terrorism threats. Sound staff screening and recruitment procedures. Training staff on the importance of security. Liaising with police and emergency services. Rather than relying on your own perceptions, your organisation may need to consider getting specialist advice from a risk management / security professional. This should enable you to determine what your highest risks are and prioritise accordingly. Training of staff members to respond quickly and competently to threats and attacks. Checking for injuries and applying First Aid. Effective communication within the location, and with neighbours and emergency services. Steps for rebuilding and rehabilitation. Providing access to trauma counselling for victims. Reviewing the organisation’s risk management and response plans. Developing a continuity plan for the organisation. Throughout the whole process one of the most crucial elements is that of effective communication and access to and sharing of information. The Commonwealth is responsible to ensure that organisational owners and operators have access to relevant and up-to-date information regarding terrorism threats. See links below for more info.